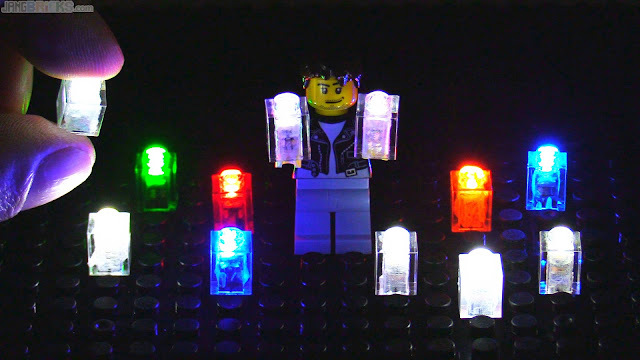 Two years ago, a campaign showed up on Kickstarter promising a way to deliver lighting into and/or onto LEGO models without attaching any wires, flipping any tiny switches, or ever replacing any batteries. Sadly, it did not receive enough backing and failed to fund, but the creator returned for a second round with a more polished product, and this time it's a success! After emphatically pleading "help me to help you," I was able to get a two-day loan of a prototype unit, and I dedicated the entirety of those two days to nothing but testing, photographing, filming, and posting about i-Brix, because I believe in it that strongly. It was a busy & stressful couple of days, but well worth it. You see, back I first bought my house I had track lighting installed over what would be the LEGO city. At that time I invested heavily into expensive Philips Hue app-controlled color-changing LED bulbs to enable time of day lighting effects throughout the room. What I didn't have a plan for was how to light the city, itself. DIY LED lighting with countless wires having to be routed through every structure seemed like an absolute nightmare. I tried a handful of battery-based systems made specifically for LEGO use and those were also no good for me as having to flip a ton of little switches everywhere just to capture a brief video would be a maddening chore. i-Brix is the solution I needed, and with it, I hope I'll be able to mostly achieve my original goal of lighting up all of New Jang City. Skyscrapers will still require some additional work, but most of my requirements will be covered. Now I just have to wait for the funding phase to close and for the final product to be produced! This reminds me of Skylanders "LightCore" technology. It funds the same day you post your article. That's influence right there. Do you think if you had a series of the power plates along a train track you'd be able to illuminate the interior of the train as it traveled along?